Friendly, Carlisle Grounds, 25 August 2017. Mark Salmon shot just over the crossbar on 9 minutes and Gary McCabe ‘s free kick on 23 minutes went inches over the crossbar. Wexford took the lead on 29 minutes when Aaron Dobbs scored with a neat finish. The ball ended up in the Wexford net on 35 minutes when a defender turned the ball into his own net but the referee ruled it out for offside against a Bray player. Wanderers leveled the score on 41 minutes when Ryan Brennan back heeled to the neat. Brennan added his second four minutes into the second half with a diving header at the back post. Brennan was denied his hat trick on 55 minutes when his header was tipped onto the post by Bolger and away to safety. Ger Pender scored the third on 85 minutes with a neat finish low into the corner of the net. 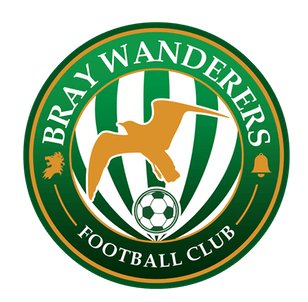 Bray Wanderers: Lee Steacy; Hugh Douglas, Karl Moore, Conor Kenna, Tim Clancy, Keith Buckley, Mark Salmon, Gary McCabe, Ryan Brennan, John Sullivan, Aaron Greene, Subs: Darragh Noone, Jason Marks, Ger Pender, Jamie Aherne, Derek Foran, Calvin Rogers, Jake Ellis, Ryan Coulter (all 60 mins for Steacy, Douglas, Moore, Clancy, McCabe, Brennan, Sullivan & Greene). Ryan Brennan (re-introduced for Salmon 82). Subs:Eoin Porter, Andy O’Connor, Adam O’Rourke, AJ Lehane. Very good match but we really dominated after Brennan equalised and they didn’t threaten some good finishes from Brennan and Pender.